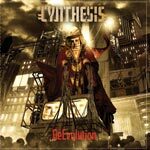 Cynthesis' DeEvolution is the new project from Zero Hour founders (and twin brothers) Jasun and Troy Tipton, and marks the return to collaboration with original Zero Hour vocalist Erik Rosvold. Determining the origins and principals of Cynthesis may be easier than explaining the music. Best analysis is that DeEvolution is heavier progressive rock, nearing metal. After that all bets are off. DeEvolution seems to be marked by songs built around movements of experimentation. A possible analogy would be building a movie screenplay, even a book, around scenes, and then joining those those scenes together. It's as not disjointed as that sounds. Yet, listening to Incision or Divided Day, two of the most intricate arrangements, it sounds like the Tiptons had some clever sketches and then brought them together for a larger arrangement. Both are pieces that contrast heaviness with moments of melodic subtlety. In the middle, Shallow World and Profits of Disaster are quizzical, but entertaining, contrast. The former offers simple piano and vocals with some synthesizer atmosphere. Then the latter brings guitar to the mix, and forefront, with the other elements. At the end, The Edifice Grin revisits the contrasting heavy and light mixture. Twilight offers an instrumental reflective of those hours with electric guitar and synth ethereal atmosphere. For the finish, A Song of Unrest, delivers a nearly anticlimactic piece: stirring but reflective of the other elements within DeEvolution. Reflecting upon several listens, Cynthesis offers a 'true' progressive rock/metal experience. While marked with contrasts of heavy and light, the overall mood is nearly contemplative, meditative. Ultimately, DeEvolution is what 'progressive' music should be intriguing, entertaining and, sometimes, confounding enough to challenge. It's all here with Cynthesis' DeEvolution. Recommended. DeEvolution is what 'progressive' music should be intriguing, entertaining and, sometimes, confounding enough to challenge. It's all here with Cynthesis' DeEvolution.